Cool. Another marriage study for our parents to throw in our respective faces, usually packaged within an email that has the subject line, "WHEN WILL I HAVE GRANDCHILDREN?!" Except, wait, this one is chocked full of good (hey, even empowering) news for all those single ladies. In fact, the very in-depth but still approachable study, courtesy of a whole host of educational institutes titled Knot Yet, breaks down the earning potential of those who marry below the average age of marriage, and those who marry above the average age. (For women, the median age is 27, dudes are at 29). 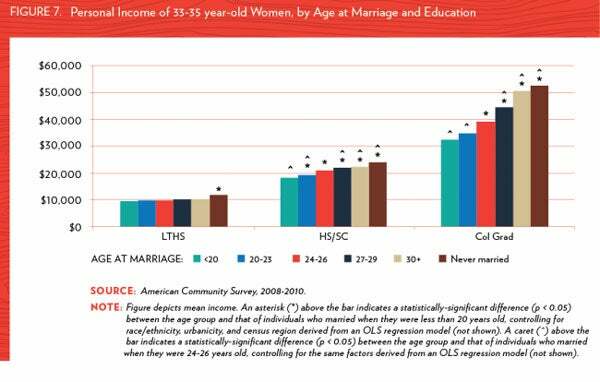 The study explains that ladies who wait until their 30s to get married end up making significantly more, especially if they've got a college degree.